When the shopping gets a wee bit out of control, trust some sane minds in the group to lead the deviant souls back to the right path. And so, the hours spent at CentralWorld or Platinum Fashion Mall in Pratunam area must be intermittent with good food; not random snacks, ice-cream or fast food in the malls. After all, the Thai street foods lining up the perimeters of the malls deserve a mention. Surely some of you must remember THIS POST on salt-grilled fish in the evenings? 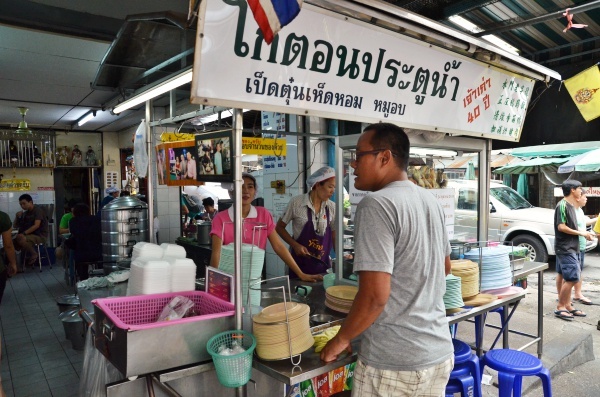 A challenge for most visitors is the lack of English language signboards; especially the famed street food champions hidden within nooks and crannies; and emblazoned across their signboards are Thai words that you can barely tell them apart. Luckily, Go Ang Chicken Rice Restaurant across the road from Platinum Fashion Mall has two very distinctive features; the shocking pink shirts donned by the workers; and a heavy crowd during lunch hours. Where usually we would have settled for mindless restaurants or fast food outlets in the malls, this time around we took the initiative to meet up in the midst of the shopping spree (despite strong protests from some quarters!) at this chicken rice place for a quick bite; before diving straight right into the fray again. Not a decision that we regretted nonetheless. What appeared to be a two shop lot worth of space was completely packed with people; more locals than tourists which is a plus in our books. Ordering was scary at first since the menu on the wall was all written in Thai! Thankfully, the thick-skinned Motormouth asked for an English menu and voila! Laminated pieces of pictures with English descriptions assisted us in our orders. Plain poached chicken rice eaten either plain or drizzled with their condiment of chopped bird’s eye chillies in a dark sweet and spicy sauce. And don’t expect a fanciful range of beverages; the ice cold drinks in stainless steel mugs were all Chinese tea with an insane load of crushed ice. To alleviate the heat, I suppose. Though the selection ain’t exactly impressive, or mind-blowing in any sense of the word, at Go Ang, you can expect no-frills, poached chicken on your mount of fragrant, chicken oil-cooked rice with a few slices of cucumber. Some decided to go for the livers; which to me was almost devoid of all flavours but the thick, dark sauce loaded with bites of ‘cili padi’ (bird’s eye chillies) elevated the taste significantly. 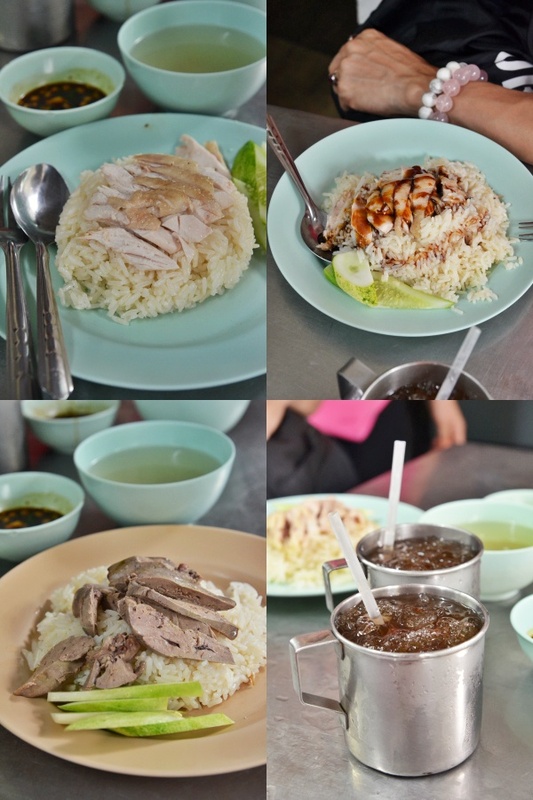 As far as Thai style chicken rice goes, this checked all the boxes; flavoursome fluffy grains of Thai rice and firm, tender slivers of chicken poached and served with a killer condiment. The drawback could be the rather bland meat if not taken with the sauce. 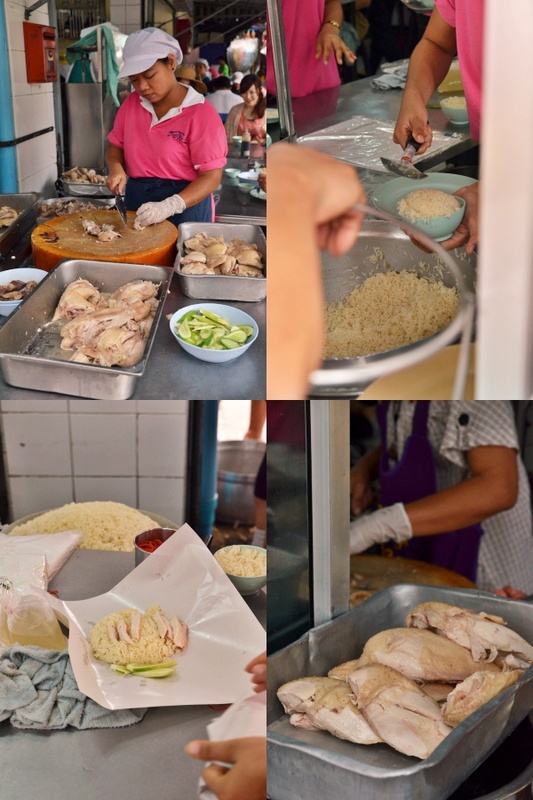 Still, here’s a chicken rice mecca amidst the almost endless stretch of street food stalls that I won’t hesitate coming back again the next round. Until my search leads me to a better choice out there. *About 40B/MYR4 per plate of chicken rice for one. Very informative post! There is a lot of information here. I really enjoyed the quality information you offer to your visitors for this blog. I will bookmark your blog and have my friends check up here often.